Blepharoplasty is surgery of the eyelids to correct droopy upper eyelids and puffy bags below the eyes. These not only make you appear older, but may also interfere with vision. A face lift would be required to remove crow's feet, wrinkles or lift sagging eyebrows. Blepharoplasty can be done as a single procedure or in conjunction with other facial surgery, such as a face or brow lift to help bring back your youthful appearance. Droopy upper eyelid conditions are corrected through incision within the natural crease of the upper eyelid, allowing removal of deposited fat as well as muscle and tissue tightening. Removing excess skin is also an option. Lower eyelid conditions may be corrected with an incision just below the lower lash line allowing removal of excess skin. A trans-conjunctival incision (one hidden inside the lower eyelid) is an alternative technique to correct lower eyelid conditions and also to redistribute or remove excess fat. Incisions are made so that the scars will be well concealed within the natural eyelid structure. Local anaesthesia combined with an intravenous sedation. Usually one hour for two eyelids or two for both eyes. You can usually return home on the same day. Moderate pain can be expected. Your surgeon can prescribe medication to alleviate the initial feeling of dryness in the eye and the experience of irritation or itching which may be felt. Once completed, lubricating ointment and cold compresses may be applied to your eyes. In some cases, the eyes may be loosely covered with gauze. Rest is advisable following your operation, your FVH surgeon advising on how much is needed. Recovery times vary depending on the individual, usually between one and two days. You may choose to rest at FV Hospital or in your hotel, potentially leaving hospital on the same day. You should avoid reading in low light. You may not wish to work on the next day if your eyes are too swollen. Contact lenses should not be worn for two weeks or more. Your FVH surgeon will advise. You should not do any strenuous actitivity or drink alcohol for three weeks. Some bruising and swelling, disappearing after a few weeks. This simple procedure is undertaken five to seven days following surgery by your FVH surgeon when you return for the scheduled post-operative consultation. Scars heal very rapidly, disappearing completely within a few months while the aesthetic results should be apparent in a matter of weeks. Transfer to FV Hospital for Surgery. 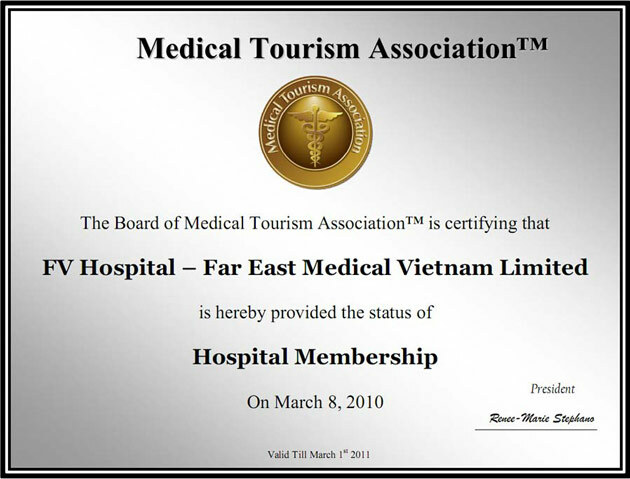 After surgery, transfer to Thao Dien Village (www.thaodienvillage.com) for relaxation. Relaxation at Thao Dien. Free use of health club facilities including fitness room, sauna, steam room, Jacuzzi, etc., during opening hours. Enjoy 10 per cent discount on all other services at Spa Authentic. Full day “Cu Chi Tunnels and Cao Dai temple” trip. Tay Ninh, near the Cambodian border, is home to the unique Cao Dai sect. The religion is a hybrid of Buddhism, Taoism, Confucianism and Christianity. The Cao Dai Temple at Tay Ninh has been described as a Walt Disney fantasia of the East. The temple’s exterior is decorated with multi-coloured dragons of all shapes and sizes. Above the main entrance is the all-seeing holy eye, the symbol of the Cao Dai sect. The interior is just as engaging as statues of Jesus Christ, Buddha and the Hindu god, Brahma, stand side by side. The trip to Tay Ninh is combined with a visit to the Cu Chi Tunnels. Today the remaining tunnels have become a major tourist attraction giving the visitor a unique experience and a feel of what underground life in the American/Vietnam war must have been like. In the morning at 8.00am, we’ll drive to Tay Ninh to observe the midday service. Following lunch, we will drive to the Cu Chi Tunnels and then return to Ho Chi Minh City around 5.00pm. Check out of Thao Dien. Transfer to Long Hai beach, around 2.5 hours drive from HCMC. Relax at Ho Tram resort. Transfer back to HCMC. Check-in Renaissance Riverside Hotel. Morning - transfer to FV for post-discharge consultation. Note: this date could be changed depending on doctor’s advice. Sen Spa provides the perfect retreat from the stresses of travel and city life. Inspired by the traditions and rituals of Asian cultures, we offer you a unique environment in which to relax and rejuvenate. Release stress and refresh with spa treatments such as a herbal steam bath, aromatic hot and cold jacuzzis, two-hands massage, and more. After your treatments, you will be transferred to the relaxing Thao Dien Village riverside complex for a delectable Vietnamese dinner.